If you don't want to just dump your ashes on the snow or ground, there are some useful things you can use them for around your homestead. Even Cinderella had to do it. It’s a messy, dusty and potentially dangerous part of heating a home or outbuilding with wood. 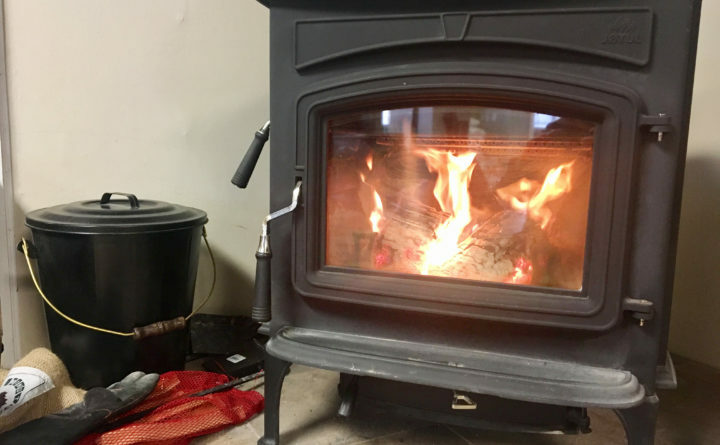 But by following a few simple steps and taking a bit of extra time, the regular cleaning of the wood stove or fireplace ashes is safe and can provide a useful natural resource around the homestead. Ashes are the byproduct of burned wood. According to the Chimney Safety Institute of America, the type of wood you burn determines the volume of ash created. Simply put, softwoods tend to weigh less — fir, spruce or birch — and generate more ash than hardwoods like beech, maple or ash. In either case, when the fire burns down there is going to a new lay ashes in the stove or fireplace. Woodstoves and fireplaces should be cleaned out on a regular basis, but not after every single fire. Keeping at least a 1-inch layer of ashes in the bottom of a firebox during the heating season helps protect the bottom of your firebox as the ashes are a buffer between actively burning wood which can damage or weaken the bottom of your firebox over time. The time to clean out the ashes depends on how often there is a fire in your woodstove. If it is your primary source of heat, the ash bin should be inspected and cleaned out — leaving that one-inch layer on the bottom — every week. How do you remove and properly dispose ashes? You are going to want to wait until the fire has gone out and the ashes have cooled to the point you feel comfortable handling them. For people who heat with wood, the best time for this is first thing in the morning, before the first fire of day is started or rekindled. Use a small metal shovel to scoop out the ashes into a metal bucket. Improperly disposed wood stove ashes can spark house fires, something Endee has seen many times in his 56 years as a firefighter. To be safe, Endee recommends taking the metal buckets of ashes out of the house immediately after collecting them and disposing of them in a secure location, such as on top of a snowbank in the winter or in a moist area in warmer months, away from dry grass or weeds. If you don’t want to just dump your ashes on the snow or ground, there are some useful things you can use them for around your homestead. Add them to your compost — According to the University of Maine Cooperative Extension Office, wood ash contains has a high calcium content, so it makes an excellent liming agent along with containing potassium and other trace elements that boost the nutrient value of your compost. A liming agent that can help raise the pH levels and neutralize acidic soils. Wood ash changes the soil’s pH very quickly, according to the University of Connecticut Cooperative Extension. They recommend spreading wood ash in an application of 20 pounds per 1,000-square-feet — which works out to a five-gallon bucket of ash. Assuming your soil is already in the proper pH range, this is a good annual treatment and your garden won’t require any additional lime or potassium. Adding it to your compost as brown matter, it breaks down with green materials like grass clippings or food scraps, to create a more balanced garden fertilizer. Making compost with ash is a better option than adding ash directly to a garden plot because it can cause damage to acid-loving plants like blueberries or rhododendrons. Tomatoes, on the other hand, love calcium and a quarter cup of ashes added into a hole before planting a tomato seedling can give it quite the boost. Block pests — Wood ash can make an effective non-chemical pest deterrent, according to an online article in the San Francisco Chronicle. To keep leaf-eating pests away from your plants, combine one cup of wood ashes and 1 cup of hydrated lime in two gallons of water. Spray this liquid onto the tops and bottoms of the foliage. Crawling bugs and slugs do not like ashes and placing a circle of ashes around a plot or around individual plants will help deter pests like cutworms, slugs and snails. In liquid or dry form, wood ash applications need to be replaced every day or two, and after any rain to protect your crops. Algae control — If you have a lot of ashes and are seeing increased algae in your farm pond, This Old House online recommends tossing some ashes into the water. One tablespoon of ash per 1,000 gallons of water will add enough potassium to the pond to boost the aquatic plants that compete with algae, thus slowing the algae growth. Traction control — Spread wood ash on your driveway or walkway to melt winter ice. Wood ash contains potassium salts, or “potash” which is a natural de-icer. While you may end up tracking some of it back inside the house, the ash will be less harmful to the ground under the ice and snow than chemical de-icers. Make soap — Something for a winter project: boil your ashes in water for about 30 minutes and then let the ashes settle to the bottom of the pan to create lye — the common name for sodium hydroxide and a key ingredient in soap-making. In the ash-boiling process, the lye forms on top of the water and may be skimmed off. For making lye, the ashes of hardwood are best, as softwood ashes tend to be too resinous and produce a lye that will not mix well with the fat used in the soap making process. Chicken spa — On my farm I tend to dump my ashes in roughly the same snowbank all winter. Come spring, there is an impressive pile of light ash remaining and it’s the first place my chickens head when they start to free range in the spring for nice ash-dust bath. By the time mid summer rolls around, the chickens have completely spread the ashes around my yard. Fertilizer, soil amendment, de-icer, soap ingredient and chicken dust. It’s really pretty impressive how many useful things ashes can do around your homestead. Knowing that makes cleaning out the woodstove an enjoyable and rewarding task.